For 18 years now the tiny, decrepit but utterly wonderful Union Theatre has led the way as the home of fringe musicals. It has staged interesting revivals as well as new work, and has offered up classics and new plays. Now, for its swan song in its current premises before decamping to a brand-new railway arch conversion on the other side of the street, it appropriately presents a play that has music embedded into it. The Rise and Fall of Little Voice also has the kind of seedy and steely heart that shows off this theatre’s combination of edgy appeal and wrap-around warmth. 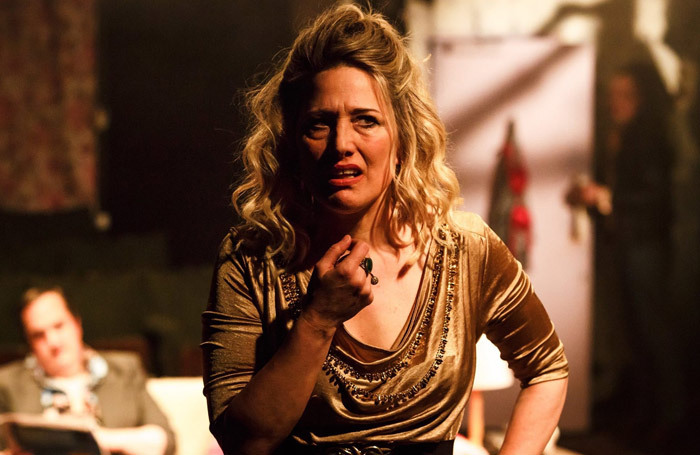 Jim Cartwright’s 1992 play about a brassily dysfunctional single mother and her sullen, virtually mute daughter – who finds her voice in channelling the great divas she meticulously mimics from her late father’s record collection – is alternately brutal and tender. Staged in the nowhere-to-hide round, Alastair Knights’ production resourcefully places the actors right under your nose – and it is simultaneously terrifying and exhilarating to watch. The utter selfishness and desperation for romance of Charlotte Gorton’s messy Mari is both palpable and painful. As her neglected daughter LV, Carly Thoms exudes both extreme vulnerability and a fierce talent to meticulously recreates Garland, Bassey, Monroe and Holliday, among others. They are beautifully supported by Mandy Dassa as Mari’s abused best friend, Ken Christiansen as the seedy club circuit agent who sees a big opportunity with LV, Glenn Adamson as the shy telephone engineer who falls for LV, and James Peake as a club manager and compere.